Notions of the Archival in Memory and Deportment emerged as a response to a discourse of disembodiment prevalent in early days of the Internet. I never believed that the physical gendered body would be subsumed in an idealized information age. Even in our attempts to externalize and expand upon the processes of the brain through the computational and storage capacities of the computer, the precariousness of the biological body persists. Somewhere along the way cultural theory veered away from body politics. 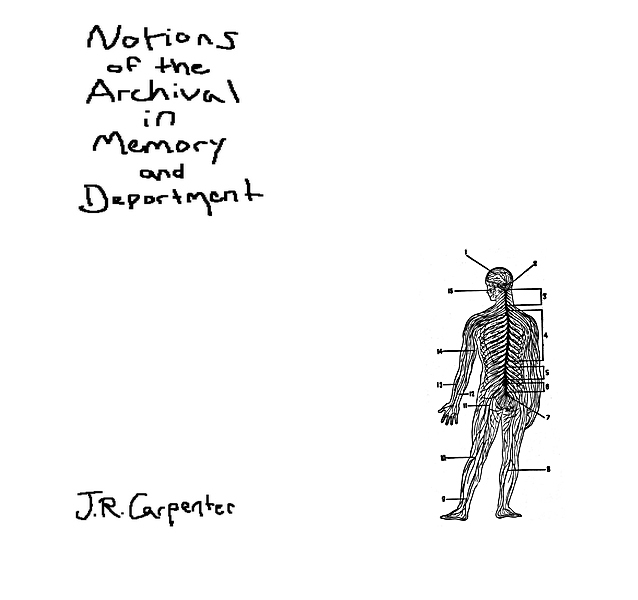 Notions of the Archival in Memory and Deportment examines from the inside, not just 'the' body, but also 'my' body in particular. I have focused on the storage and retention of bodily memory in order to explore the relationship and/or disconnect between body and mind that has preoccupied philosophers for generations. In Ethics, Part II: Of the Nature and Origin of the Mind, Spinoza writes: "The human mind is capable of perceiving a great number of things, and … is cable of receiving a great number of impressions… If the human body is affected in a manner which involves the nature of any external body, the human mind will regard the said external body as actually existing… Memory is simply a certain association of ideas involving the nature of things outside the human body, which association arises in the mind according to the order and association of the modifications of the human body… The human mind has no knowledge of the body, and does not know it to exist, save through the ideas of the modifications whereby the body is affected." Suddenly far from my brain and naked without it.